L.A. Style Icon. Blogger. E-Commerce Expert. Social Media Maven. Brand Owner. Creative Consultant. Fashion Designer. Model. Freelancer. Billboard Queen. This is not a little black book sample of ideal PR contacts. Rather, this is a short list of the various hats worn by epically cool blogger and fashion designer, Chanelle Laurence. In 2009, Laurence set out on a small vintage e-commerce adventure to gain a following and earn some money, with the ultimate goal of starting her own fashion line. Fast forward six years later and Laurence is nothing short of a high influencer in her field. She’s been featured on Rachel Zoe’s curated lifestyle blog, The Zoe Report. Her face and blog were unveiled on a Forever 21 billboard in Times Square – on New Year’s Eve. She also was seen, just last week, taking selfies with Victoria’s Secret’s Miranda Kerr at a Reebok for Women event in Los Angeles. 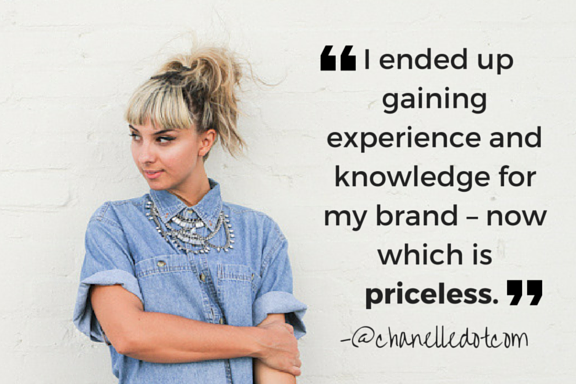 And these are just a few fine moments in her journey from blogger to legit business owner. Most recently, Laurence delivered on her dream of starting a clothing line. The collaborative project with partner Christian Ojeda – inspired by their Los Angeles native upbringing – combines their different experiences to “create the ultimate cool-girl brand,” aptly named Valley High. 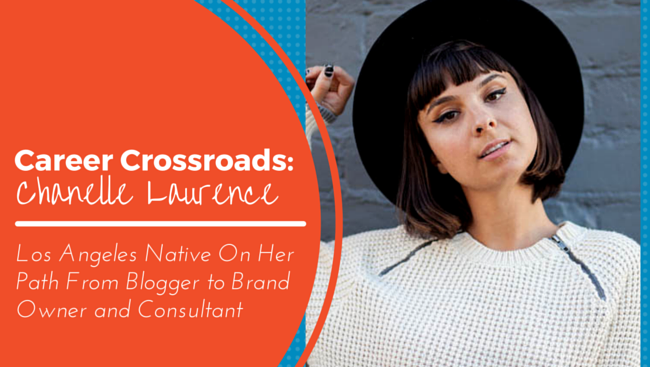 Laurence always wanted to be a business owner, but she knew her long-game concept would take time. She had to start forming the building blocks by gaining experience and generating some revenue. With that, Penelope’s Vintage – a small online shop of sunglasses and 80s and 90s fashion – was born. She shopped out hidden treasures from local thrift stores, styled and modeled the clothing, and brought the items directly to the consumer via Etsy, and eventually through the shop’s website. To promote her shop, she started a blog called “The Penelope Times,” where she featured items up for sale and other apparel. In doing so, she foresaw a much greater opportunity. From there, Laurence took blogging more seriously and committed to it full time. She pushed herself to attend every event she could to network as much as possible. With it came opportunities to work with some of her favorite brands and, ultimately, resulted in success for both Penelopes. The blog remained ever-present, her shop saw growth year over year, and Laurence’s clever styling was being featured on major blogs like Lucky Magazine’s and Nasty Gal’s. Five years after starting Penelope’s Vintage, Laurence felt she gained the network, experience and knowledge to launch her next business venture with boyfriend Ojeda. This was something they’d always planned. They went to the same fashion school. They both wanted to be business owners. Each had their different perspectives and experiences to bring to the table. It made sense for them to do this together. So, while Laurence pursued blogging and vintage e-commerce, Ojeda gained hands-on experience in graphic design, working for leading men’s streetwear brands. They launched their women’s lifestyle brand Valley High in February 2015 – and so far, so good. They hosted their first event at Coachella. They also secured a retailer in Japan and collaborations with various websites. For ladies who love to wear graphics and shop their boyfriend’s closets, this brand is a welcome addition. In the production of their line, the duo very much works hand-in-hand. Laurence focuses on the silhouettes, while Ojeda executes the graphics. Then, they both come together to finesse their collections. Once ready, Ojeda shoots the photos and Laurence moves on to social media and marketing. While Valley High is the focus of Laurence’s efforts, it didn’t stop her from continuing to explore other avenues. In her time building two e-commerce brands, blogging, and networking, she’s learned a few things – and, so, building a consultancy for like-minded individuals was a natural next step. CL Creative Media started as a resume site for Laurence, showcasing the job roles she’s had, her businesses, along with her many features. But as she built up the site, it started to take on its own identity. So, how do all these ventures work together? They don’t really, says Laurence. The only common ground is her blog. “I can blog about Valley High or Penelope’s Vintage, and I can use my blog to help out my clients or put them in contact with my blogger friends that are a good fit for them. Otherwise, I like to keep everything separate so they can grow on their own.